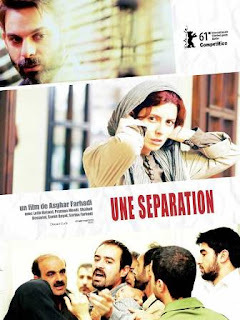 A separation, the Oscar-nominated foreign film, and one of the best movies of last year, is directed and written by Asghar Farhadi. It follows the life of a broken family, as the woman wants to leave the country, Iran, while the father wants to stay with the daughter and take care of his ill father. The newly-hired woman to take care of the old man triggers a number of complication for the two families. First of all, you need to know this film is very good- solid filmmaking from many points of view, its main attraction and strong feature being the script: the storyline, the characters, the dialogue, the emotions translated through words and action, they all create a world and a story that can appeal to anyone around the world; its sense of reality is fascinating and makes this film even better because you can relate to it, you can understand the situation and it's something likely to happen anywhere. What is even more interesting is the mix of culture, tradition and technology and how it translated into the 21st century in these specific countries. The laws and beliefs of ancient times and the religion still have a huge impact on these countries, moreso then Western Europe or America, but they are trying to integrate, evolve and have a better life- that's one reason why the mother, Simin, tried to convince the judge and her husband that leaving the country might be a good idea. Another good example would be the scene in which the caretaker has to call by cellphone her imam (priest, I presume), to ask if she can wash the old man when he pees his pants or is it considered a sin. As the film progresses, the situation gets more complicated, new details emerge and you can observe the story from different point of views. That's what good about this movie- it doesn't tell the story from the Nader's point of view, or Simin's or Razieh's, the caretaker, for that matter- it takes you through all, so you can understand and connect with every character, for different reasons: the audience can worry for Razieh and her health, they can get angry, as Hodjat, her husband, reacted when he heard the news about his wife situation, it can secretly root for Nader and his possible reconciliation with Simin; and the audience can surely relate to Termeh and her love and concern for her parents. Speaking of the characters, the performances are spot on and very realistic, all of the actors giving 100% in showing the true colors and emotions of the people involved. The cinematography is visually appropriate to the feeling of the movie, as the editing, which is raw and aggressive, in perfect accordance to the general direction style of the film. In the end, A Separation is a story about human nature- we all lie or do bad things, most of times believing it's the right thing to do or maybe that our lie will not affect others, but in the end, our actions, even in the smallest, non-important manner, can influence and change a man's life. All in all, I must say it isn't the most entertaining or easy-to-watch film out there (I was slightly bored in some moments), but it does have a great story and many layers that some will appreciate. Also, considering it is a shoe-in for winning Best Foregin Film at the Oscars, you should give it a try. Great review! I can't wait to see this movie. Very nice review Aziza. I'm hoping to see this soon (possibly this weekend if it's open here). This film is amazing! Glad you dug it! Yes, it should win Best Foreign Language Film (even though I haven't seen any of the other nominees - I know it is good enough). I can't wait to finally get around to this film - when it's available of course. @Sati: Hope you get to see it soon! Thanks! @Chip: That's unfortunate- have you tried video-on-demand websites like Netflix or Lovefilm or something similar to that? @Andy: It is good enough, plus the extra nomination for best screenplay shows that it is a strong contender. I would be surprised if it didn't won! @Castor: High expectations are never good Castor- read my last part about not being that entertaining, maybe that will calm you down :) Thanks! Sam: Thanks Sam, I hope you see it soon, it is worth it! It is amazing and shocking to see how the legal system and culture acts in a situation such as a separation. I can see why it is loved so much!! The trailer pulled me in. Hopefully i will find it at a local art house but if not I will probably catch it on BD. @Scott: I think one of the best things about this movie is just the fact that it shows us a real perspective on the legal system in other countries- we get to see how they deal with these kind of situations! @iluvcinema: Hope you see it soon! Thanks for dropping by! Great review and nice weblog! I will follow it for sure. Iran is not a Arab country. Sure we have some similarities but we are not Arab. To my Arab friends that may not like what I said: I am not comparing anything and I believe in equality. @Ehsan: First of all, thanks for dropping by and I hope to see you again around here :) Second of all, I am sorry for my mistake, I didn't realise and I made an asumption that is wrong! Thank you for bringing it to my attention! @Aziza - movies are usually not available for video on demand until after they have finished their theatrical run and have gone to DVD. Currently, the only way to see the movie other than in a theater would be to find a copy on the internet and download it. I've sometimes run across popular movies on message forums, but not small, foreign language films like this one. Netflix is where I will likely see it, once the DVD and/or streaming becomes available. @Chip: Sometimes, the movie can appear on Netflix or other websites similar to it even before going to DVD; it's part of the deal between companies. In Separation's case, it was first released in February last year in the Berlin Festival, if I am not mistaken (I might be), so there was plenty of time to come on DVD or netflix! But yeah, it is found online, as torrent files, as well! Spot on review! You are 100% correct about its accessibility, which is one thing that makes it so wonderful. As time has went on since I watched it, it has seemed better. Definitely one of last years best. @FilmMaster: I agree, one of the best movies of last year! Iran is not an arab country! @Anonymous: I know, someone commented on that before, but I must have forgotten to edit it! Sorry! I didnt get the ending which parent did the daughter choose to be with?